Wherever we look in the Universe—at stars, nebulae, galaxies, clusters of galaxies and the space between galaxies—we find magnetism, generated by the presence and motion of electrically charged particles. But cosmic magnetism is as challenging to study as it is ubiquitous. Cosmic magnetism can be incredibly weak. For example, a galaxy’s overall magnetic field is a million times weaker than the Earth’s magnetic field. Also, we cannot study a magnetic field directly, as we do a star by studying the light it emits. Instead, we study cosmic magnetism indirectly by observing synchrotron radiation and an effect known as Faraday rotation. Synchrotron radiation is emitted by charged particles, travelling at nearly the speed of light, spiralling along magnetic lines of force. So, we know that wherever we see synchrotron radiation, there is a magnetic field. The properties of synchrotron radiation reveal the strength of the magnetic field. And its polarization reveals the magnetic field’s direction and orientation; in other words, it reveals the direction in which a compass would point were it in the vicinity. We can also study a magnetic field by observing the effect it has on radiation passing through it—an effect called Faraday Rotation. A radio wave, like a wave on a pond, oscillates or vibrates in a single direction or plane. For example, a wave on the surface of a pond moves up and down in a vertical plane. When a radio signal passes through a magnetic field, the magnetic field rotates the plane of vibration. This rotation gives us information about the strength and the polarity of the magnetic field along our line of sight. Observing Faraday Rotation in the emission of distant, background objects like galaxies, we can infer the nature of the magnetic fields lying between us and those objects. Astronomers study cosmic magnetism through investigations such as the Polarization Sky Survey of the Universe’s Magnetism (POSSUM). 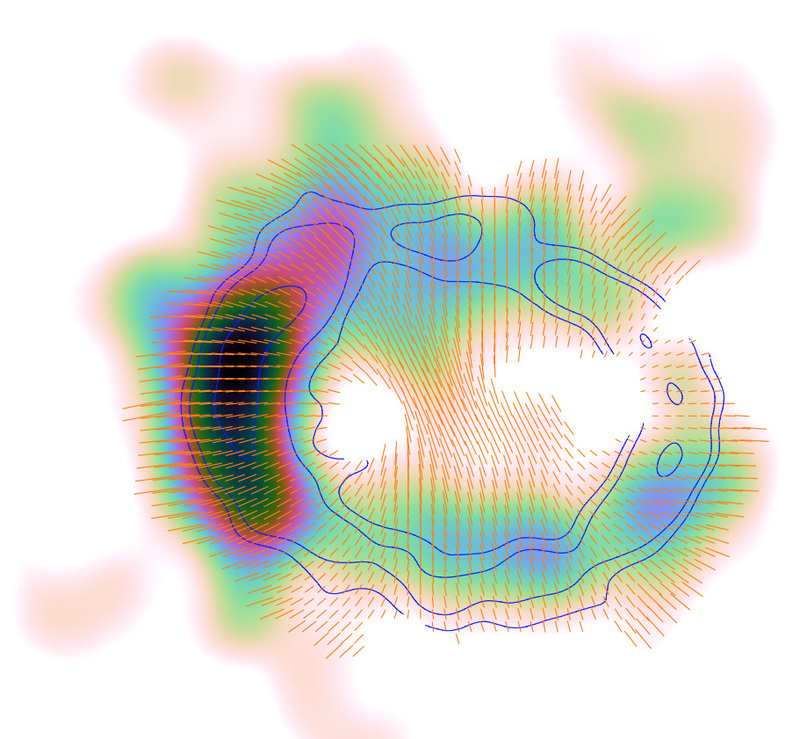 With the Australian Square Kilometre Array Pathfinder (ASKAP), POSSUM will help astronomers understand magnetic fields in galaxies, clusters of galaxies, and in diffuse intergalactic gas by measuring the Faraday Rotation in the emission from millions of galaxies over 70% of the sky. Did cosmic magnetism originate through a “top-down” or “bottom-up” process? In other words, did galaxies acquire their magnetic fields from the magnetism that permeated the universe, or did magnetism originate in individual galaxies which then led to more widespread magnetism? What role does cosmic magnetism play in the formation of large scale structure in the universe? How and when do the magnetic fields of galaxies form and evolve? What role does magnetism play in processes and phenomena within a galaxy such as star formation and supernovae.